Organized into a township in 1793 Anderson has been rated as one of the most livabile communites in Greater Cincinnati. Featuring a wide variety of housing, shopping and dining options Anderson Township has a lot to offer residents and is only minutes away from Downtown Cincinnati. Located in Warren County Mason started off with the name Palmira (later spelled Palmyra) and was founded by a revolutionary war veteran. The name was changed to Mason (reflecting the founders name William Mason) in 1835 after post office stated there was already another Palmyra in Ohio. Covering 18.67 square miles was named as one of the top 50 places to live in 2008 and 2011 by CNN. 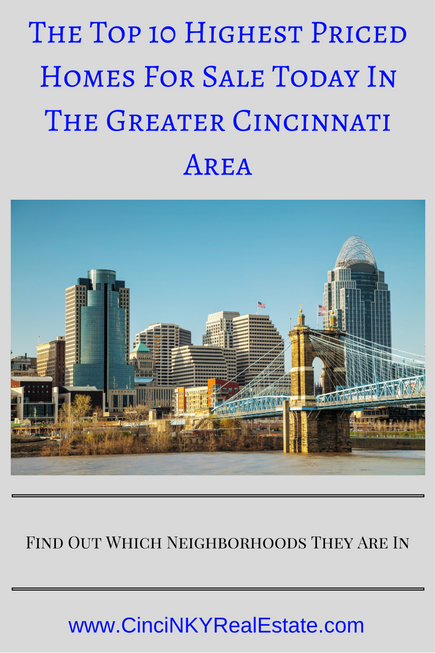 Mason is one of the more affluent communities within the Greater Cincinnati area. After purchasing 150 acres of land in Northern Kentuck a group of individuals founded the town of Covington, Kentucky in 1814 and a year later Covington was incorporated by the Kentucky General Assembly. Covington lies just south of Cincinnati and is one of the 5th most populated cities in Kentucky. The homes in Covington on this list are condominium homes found in The Ascent, a luxury condominium tower offering a great view of the Ohio River. This list is subject to change based on homes getting sold or price changes. About the author: The above article “The Top 10 Highest Priced Homes For Sale Today In The Greater Cincinnati Area” was provided by Paul Sian. Paul can be reached at paul@CinciNKYRealEstate.com or by phone at 513-560-8002. If you’re thinking of selling or buying your investment or commercial business property I would love to share my marketing knowledge and expertise to help you. Contact me today!